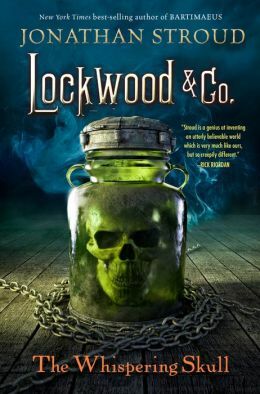 The Whispering Skull, the second book in Jonathan Stroud's Lockwood & Co. series, is just as complex, entertaining, and ghost-stuffed as its predecessor. It has the same faults, too, but they remain happily minor. It's been six months since the events of The Screaming Staircase, and things have improved for the three teenage members of Lockwood & Co., the smallest of London's many ghost-hunting agencies. Lucy Carlyle, Anthony Lockwood, and George Cubbins have worked out their business model: Anthony handles the clients, Lucy has the strongest psychic Talent, and George does the research. But when the British government hires them to find a stolen artifact that allegedly allows its users to communicate with the dead, the trio immediately find themselves in over their heads—and stuck in a neck-and-neck competition with their greatest rivals, the far larger and better-funded Fittes Agency. The Whispering Skull isn't perfect. While Lucy narrates the novel, and this installment introduces a memorable new female character, this is still a very boy-heavy series. (I winced at the casual sexism of the line “[This is] why I have no female friends,” used to describe Lucy's desire to slap a soppy female psychic.) The foreshadowing was too obvious, and Anthony—and, to a lesser extent, George—continue to walk a fine line between “intriguingly inscrutable” and “just plain underdeveloped”. On the other hand, I whipped through all 424 pages of this story in a single sitting. I had quibbles, sure, but 99% of The Whispering Skull is funny, scary, and smart, with teasing hints of possible romantic entanglements to come. It's also a deeply satisfying series installment that closes on a new and tantalizing note. I'll keep wishing for more female characters and a less heavy hand with the plot foreshadowing, but I will also be the first person in line for the next installment.